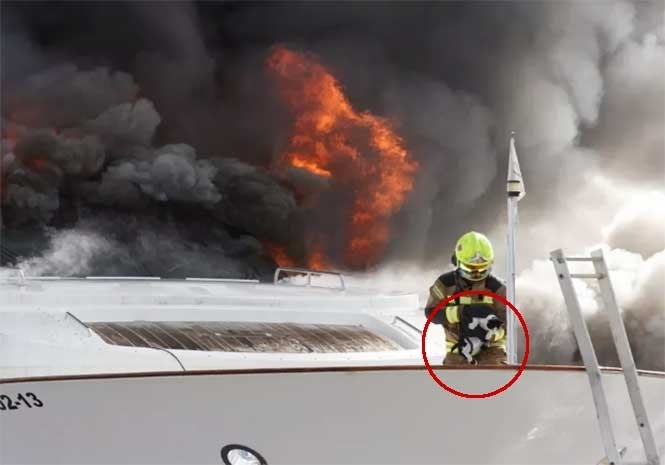 A LUCKY cat must be counting its lives after a brave firefighter rescued the frightened feline from the bow of a blazing yacht in Spain. Fire broke out on the 30-metre luxury craft while it was in dry dock in Alicante port on the Costa Blanca. As flames licked the vessel and huge plumes of black smoke rose from the luxury boat a plucky firefighter scaled a ladder to lift the terrified cat to safety. Ten workers at the boatyard tried to tackle the fire before the arrival of the emergency services and nine were taken to hospital suffering the effects of smoke inhalation. Twenty-five firefighters worked to extinguish the flames. The cat was last seen making a hasty exit down the road away from all the commotion.